These 52 inspiration cards celebrate the gift of living on this magnificent planet as an awakened, aware, and loving human soul. The quotes have been carefully chosen to lead you back to the beautiful and eternal truths of your being, and the depth, width, and splendor of your life. Enjoy these cards for centering meditation, reflection and sharing. 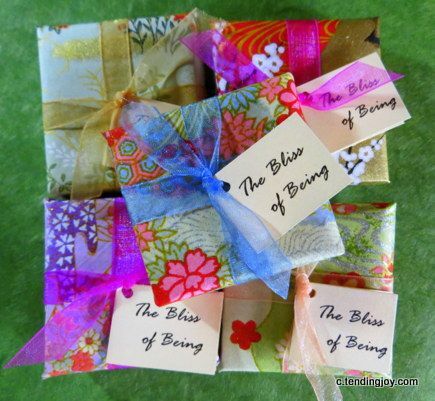 A lovely gift for spiritual friends, yoga students, teachers, and retreat participants, there is a discount option for bulk purchases below. Note from Ingrid: The other day, a woman came up to me in the street and thanked me for these cards. She must have purchased them through the gallery. She said she keeps them on her kitchen window sill, and chooses a new one every Sunday for reflection. She thanked me for helping her keep in touch with the sacred dimension of living. I was so moved. 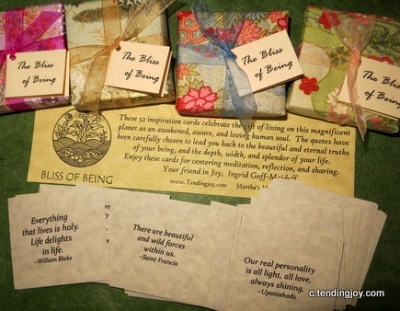 I chose the quotes on these cards because they can really touch the heart of each of us, bringing us back to our center, to the bliss of being. I like to select one at random before a period of stillness. They lead me back to the essence of my soul, the wisdom of my heart, and the love of my spirit.